In May this year, One News ran a story on a US skincare company releasing what it was calling “drinkable sunscreen”. Around the world, various sceptical websites also picked up the story, such as Doubtful News and Neurological Blog. The message was roughly that a “drinkable sunscreen” is a cool idea that isn’t entirely implausible, but that this company’s “Harmonized Water” product seemed to be entirely ineffective pseudoscience. He also pointed out to me on Twitter that this company, Osmosis Skincare, has a New Zealand distributor, and that they have a website. Here’s that website’s Harmonized Water product listing page. If you look at it now, you’ll luckily see that although it does list a large number of “Harmonized Water” products that almost certainly don’t do what is claimed about them, it does not include any products that claim to be able to be used as “drinkable sunscreen”. The reason for this is that the Advertising Standards Authority has upheld a complaint I lodged against their online advertisements for these products. My full complaint is available for you to read, as well as Osmosis Skincare’s response and the ASA’s decision, on the ASA’s website. I encourage you to read it in full, but I’ve put some of the highlights in this article. The gist of my complaint was, as usual, that I don’t believe the advertiser has any evidence to support the claims they were making about the product. I also argued that the advertisements “abuse scientific terminology in a way that seems intended to exploit consumers’ lack of knowledge”. New Zealand has the highest rate of melanoma in the world, and other skin cancers are also very common. You can help reduce your risk of skin cancer by using sunscreen the right way. By misleading consumers into believing they are protected when in fact they very likely are not, this advertisement is likely to increase their risk of contacting [sic] melanoma due to unprotected exposure to UV radiation from the Sun. This misrepresentation is highly irresponsible. They also contacted Osmosis Skincare to ask what the “scientific basis” for their claims was. The full message and its response are available at the link. Osmosis Skincare confirmed that the product is 100% water and didn’t provide them with any evidence to support their claims. 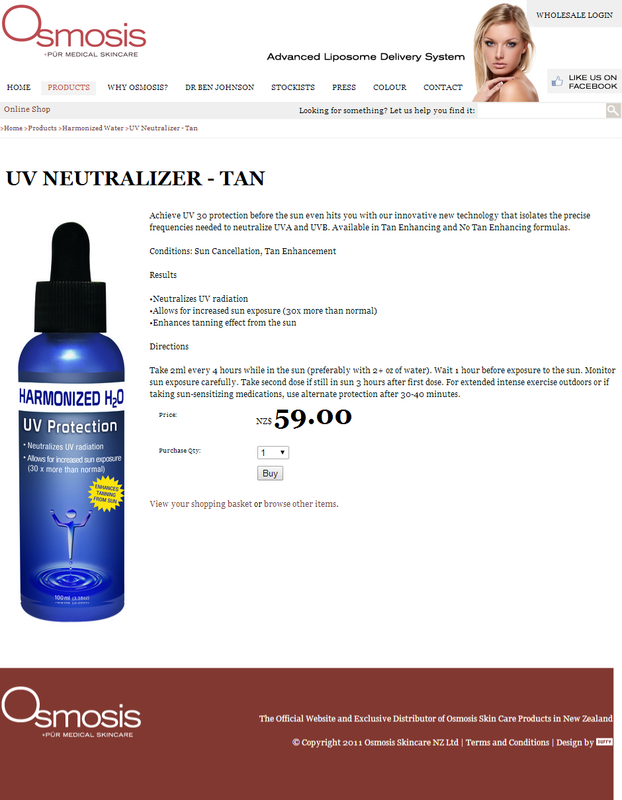 In Osmosis Skincare’s response to my ASA complaint, they said they’d made some changes like calling the products “UV Neutralizer” instead of “UV Protection”. How they thought this made it acceptable is entirely beyond me. This is a new type of technology being used in this way and Head office can reference the internal research they did showing the product to be effective, but their independent clinical trial isn’t until the 28th of June, whereby they will put 30 people outside for one hour in San Diego, CA at noon supervised by a plastic surgeon. So perhaps we have some extra time to submit these results? We are told our UK distributor will also be conducting their own study. We have been selling this in New Zealand for the past couple of years without any issue. I can’t say I was surprised to read that the “independent clinical trial” they were planning on would have a tiny sample size of 30 and be without a control group, let alone adequate randomisation and blinding. DermNet NZ has a page on sunscreen testing and classification that says sunscreens in New Zealand are now tested in vitro. That makes perfect sense to me, partly because in vivo testing for something like sunscreen seems like it would likely be unethical (which is mentioned on DermNet’s page) and partly because the difference between sunscreen and no sunscreen – blocking UV radiation when placed on the skin surface – would presumably be much easier to test and measure than more complex medical outcomes. I would also imagine that the placebo effect will not have a strong influence here, but that’s only a guess and I have no evidence to support that. However, a study like this would still need a control group to be able to tell how much of a difference the product made, and in such a design it would still be more rigorous to randomise participants and blind both them and the researchers to eliminate potential sources of bias. It will be interesting to see if this trial is published, and what its methodology and findings are. Especially since they’ve publicly reported beforehand that an independent trial was due to be done. The Complaints Board acknowledged the changes made by the Advertiser, however, it said that the amended advertisement was still misleading, abused the trust and exploited the knowledge of the consumer by stating that the product offered sun protection using scientific terminology without adequate substantiation. It said this was exacerbated within New Zealand as sun exposure can have significant negative effects in comparison with other countries. Accordingly the Complaints Board said the advertisement was in breach of the Therapeutic Products Advertising Code and did not observe a high standard of social responsibility effecting a breach of the Therapeutic Products Advertising Code. the advertisement was likely to abuse the trust and exploit the knowledge of the consumer by stating the product offered sun protection “30 x more than normal” and used scientific terminology like “isolates the precise frequencies” without adequate substantiation. I have to applaud the complaints board here for taking a stand against this sort of language, which abuses scientific jargon in a way that makes the advertisement sound more authoritative than it should. As they would have been able to uphold the complaint on the sole basis that the claims are unsubstantiated, I’m glad they also decided to take on this language as well. To their credit, Osmosis Skincare has quickly removed the advertisements for these products entirely from their New Zealand website, even before the ASA’s decision was released. However, as you’ll have seen if you clicked on the link to Osmosis Skincare’s “Harmonized Water” product listing page at the top of this article, they still sell a number of these products that also seem to make unsubstantiated therapeutic claims. All of my complaints about misleading healthcare claims, including this one, are now submitted under the Society for Science Based Healthcare. If you’re interested in these complaints, have a look at their website. You can also keep up to date with their complaints on Twitter @SBHNZ.